Pasta is something I prefer to make for dinner on a lazy weeknight. We prefer simple pastas with no sauce rather than one with loaded with a creamy sauce. One of our most favorite pasta, and one I make often is spaghetti aglio olio. It's a simple pasta recipe flavored with a garlic chilly oil. Today's pasta recipe is a simple one similar to that with juicy oven roasted cherry tomatoes. This is a very easy pasta recipe with just a few ingredients. While the tomatoes are getting roasted, you can cook the pasta and bring everything together in 5 minutes. Roasting tomatoes concentrates their sweetness and brings out more flavor. The juices from the roasted tomatoes acts as the sauce for the pasta. Enjoy the pasta hot with some generous amount of grated Parmesan or Pecorino cheese. 1. Preheat the oven to 190 °C | 375 °F. Line a baking tray with aluminum foil. 2. In a bowl, toss the cherry tomatoes, olive oil, mixed herbs, salt and pepper. Place the tomatoes on the baking sheet. Bake for 15-20 minutes or until the tomatoes are soft. 3. Meanwhile cook the pasta according to the instructions given in the packet. Rinse under cold water and drain water completely. 4. Heat 1 tbsp oil in a pan and add garlic. Fry till they start to change color. Add the red chilly flakes and fry for a minute. 5. Add the pasta, roasted tomatoes along with the oil and juices, basil, salt and pepper. 6. Mix everything gently and cook for another 1-2 minutes. Serve with grated cheese. I have used spaghetti here, but you can use angel hair or fettuccine. Since there is not much sauce, thin pasta works well. Instead of mixed herbs, you can use just any one herb or even fresh herbs. Absolutely delicious pasta..looks so inviting. I think I could have this pasta every day of the week. This looks amazing!! Looks super tempting ..the flavor from roasted cherry tomatoes will be awesome.. Very tempting and inviting!! Love the platter!! Delicious looking cherry tomato pasta.. Beautiful inviting clicks..
simple yet very satisfying meal! Love to have that plate! 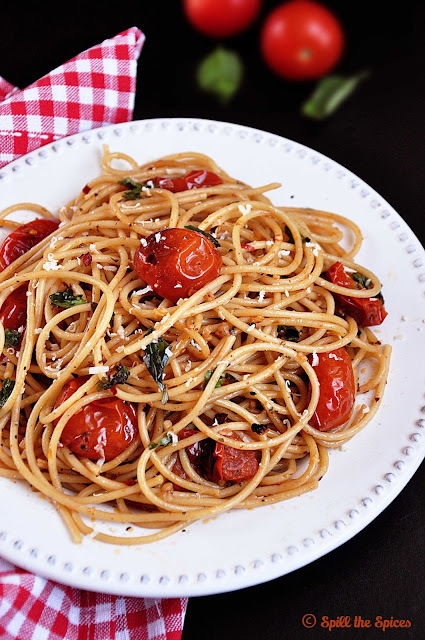 I just love the addition of the roasted cherry tomatoes to this simple pasta dish.. Lovely clicks and delicious looking spaghetti.. 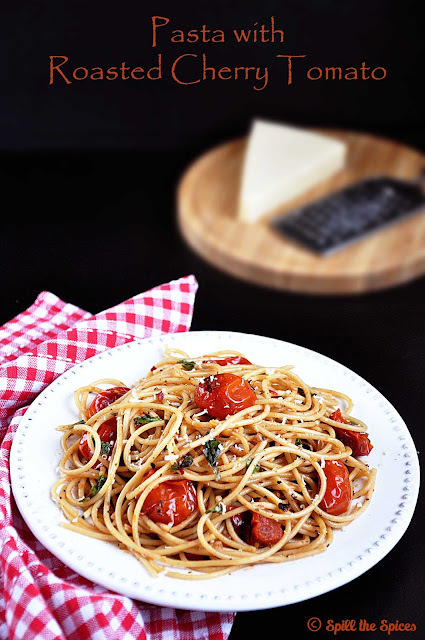 Such a simple pasta dish yet loaded with lovely flavors.. Nice recipe Sona and great clicks too..
Cherry tomato pasta looks amazing.. simple and delicious flavors..
Wow.. looks so tempting.. lovely presentation. Hi Sona, this recipe looks so yummy and I will surely give it a try! 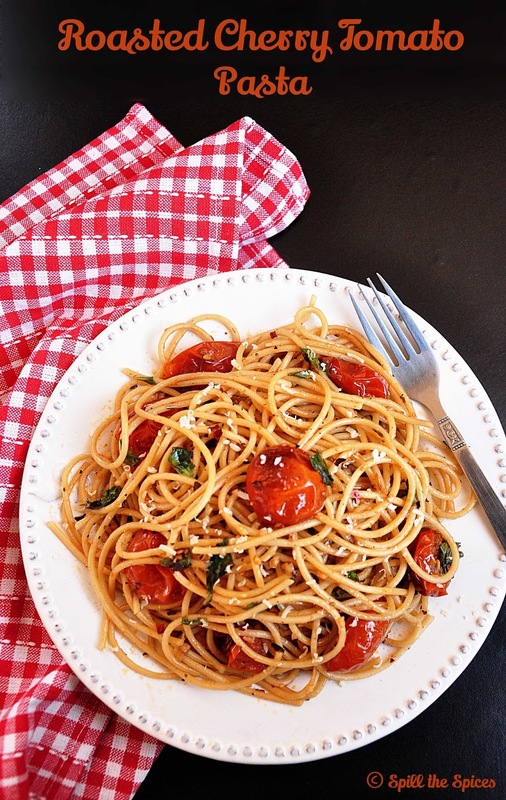 I love the sweetness of cherry tomatoes, especially combined with the pasta, Very nice staple dish.